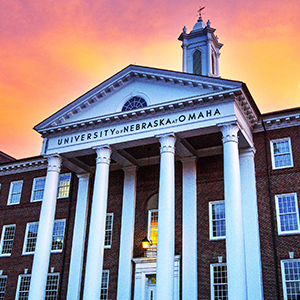 The University of Nebraska Omaha's ability to uphold its mission is dramatically strengthened as a result of our donors. We'd like to welcome new donors and thank everyone who has made a difference by financially supporting the college over the past year. There are multiple ways that alumni, friends, faculty, businesses and corporations donate to aid the College of Arts and Sciences programs and research. Many people give each year when they receive an Annual Fund request by phone or mail. Some wish to remember a classmate, faculty member or loved one with a memorial or honorary donation. Others choose to support research, establish a named scholarship or create a fellowship. Examples include the Martha C. Page Study Abroad Travel Fund, the Dr. Steel R. Hunt Memorial Scholarship and the Orville and Darlene Menard Political Science Scholarship. Named, endowed Chairs and Professorships are significant gifts that enable the college to attract and recruit the outstanding educators that prepare our students, like the Blizek Professorship in Religion and the Charles W. and Mary C. Martin Professorship in American History. Gifts to the UNO College of Arts and Sciences Fund for Excellence create new possibilities for UNO's College of Arts and Sciences for many years to come. The Foundation is a non-profit organization established by the Board of Regents that raises and manages private gifts for the college. If you have questions about establishing a new fund or scholarship, making long-range plans or giving through a different vehicle, please contact Mary Bernier. You can help the College of Arts and Sciences with a donation to the General Fund, or donate to a specific department or program.